A woman who threw green custard over Business Secretary Lord Mandelson has been given a police caution. Anti-Heathrow expansion campaigner Leila Deen covered him with the substance in central London last month. The 29-year-old from Brighton in East Sussex, justified the direct action as a "last resort" after claiming the democratic process had failed. She attended a police station and accepted the punishment "on the advice of the Crown Prosecution Service". A Metropolitan Police spokeswoman said she has been cautioned under section 5 of the Public Order Act which relates to causing harassment, alarm or distress. Deen is a member of the Plane Stupid group campaigning against a third runway at Heathrow. The government approved a new runway in February despite opposition by MPs, local residents and green campaigners. After her caution Deen said: "I have always been honest about throwing green slime over Mandelson to highlight the hypocrisy of this government's attitude to climate change and the third runway at Heathrow. "I don't regret taking action against this government's hypocrisy and am grateful that the country cheered me on for what I did. 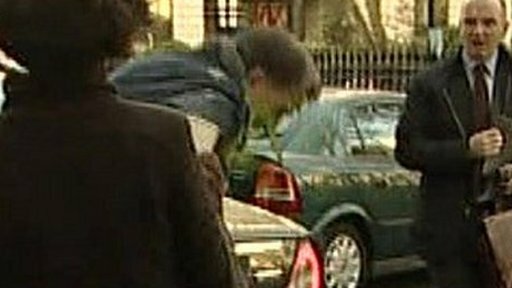 After the protest, Lord Mandelson dismissed the protest as a "crude" stunt but said he was grateful that the substance concerned was not "nastier". He rejected Deen's claims about the third runway, saying he was accountable to parliament, and said the incident had merely brought attention to the UK's need for a greener economy. Police originally said they would not investigate the matter, but backtracked after former deputy prime minister John Prescott said it would be "totally unacceptable" to allow it to pass unchallenged. Mr Prescott, writing on his blog, said: "I'm glad to see that Leila Deen has received the police caution and now accepted that her actions were plain stupid."